Lower subalpine forests are generally located on cool, moist sites between about 5,000 and 7,000 feet in elevation within the northern Rocky Mountains. Average July temperature in this forest type typically falls between 60 and 64�F. Mean annual precipitation ranges from 20 to 50 inches, with much falling as snow (Arno 1979, Pfister et al. 1977, Cooper et al. 1991). Subalpine fir and Englemann spruce dominate many stands of this forest type. Mountain hemlock, which is relatively restricted to the martime-influenced climatic zone west of the Continental Divide, and lodgepole pine, which often grows in pure stands in cold and dry locations east of the Divide, are other key components of the region's lower subalpine forests. Douglas-fir, western larch, western white pine, and whitebark pine may also be present at various stages of stand development within this forest type (Arno 1979, Pfister et al. 1977, Cooper et al. 1991). The undergrowth typical of lower subalpine forests varies from grassy (in open, parklike sites) to densely shrubby. Wet sites can support luxuriant herbaceous vegetation, while dry sites usually support few forbs. Common woody species include antelope bitterbrush, dwarf huckleberry, grouse whortleberry, common juniper, devil's club, menziesia, Oregon-grape. Common forbs include twinflower, sweetscented bedstraw, twisted stalk, queencup beadlily, wild sarsaparilla, western meadow-rue, heartleaf arnica. Other understory associates are beargrass, smooth woodrush, elk sedge, bluejoint reedgrass, and pinegrass (Arno 1979, Pfister et al. 1977, Cooper et al. 1991. 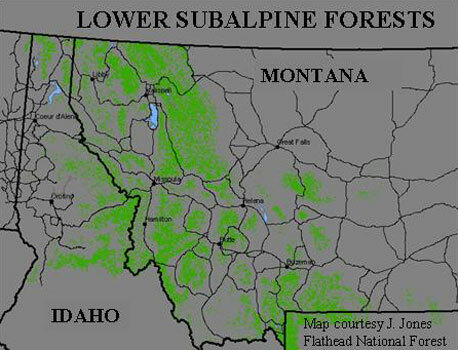 Lower subalpine forests, mapped in green at left, make up 38% of the forested acreage within our focal area. A nice collection of photos of western Montana and northern Idaho forests is housed within R. E. Rosiere's Range Types of North America website under the Northern Rocky Mountain Forest section. Lower subalpine forest is represented in photos 57, 98, 99, 102, 104, 105, 106, 107, 108, and 109. 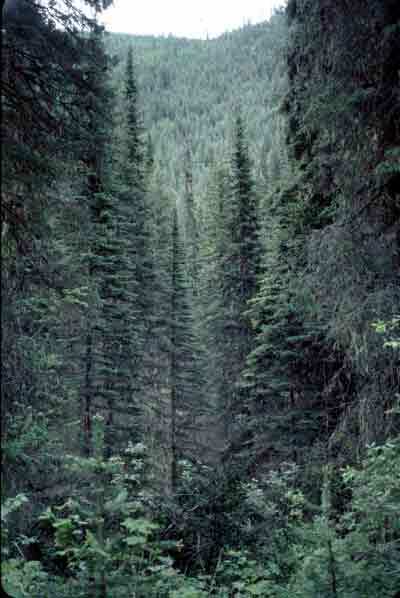 The subalpine fir / Englemann spruce forest type is relatively common in the Northern Rockies. 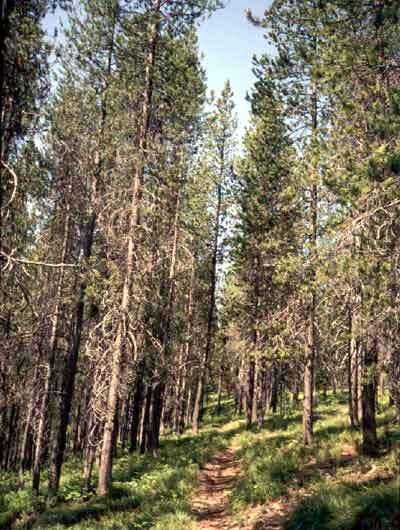 Lodgepole pine dominated forest on the Flathead National Forest, Montana. Arno, S. F. 1979. Forest regions of Montana. USDA Forest Service, Intermountain Forest and Range Experiment Station, Research Paper INT-218. Cooper, S. V., K. E. Neiman, R. Steele, and D. W. Roberts. 1991 (rev.). Forest habitat types of northern Idaho: a second approximation. USDA Forest Service, Intermountain Forest and Range Experiment Station, General Technical Report, INT-236. Pfister, R. D., B. L. Kovalchik, S. F. Arno, and R. C. Presby. 1977 (rev.). Forest habitat types of Montana. USDA Forest Service, Intermountain Forest and Range Experiment Station, Research Paper, INT-34.